It might be in bad taste to have a post about peanut butter rice krispie treats, what with the current salmonella contamination of so many peanut-based goodies, but really, you can look at this as a public service announcement. Most big-brand peanut butters are NOT on the recall list, so if you go out and get a jar of Skippy (which is what I use for baking), you can have your peanut butter sweets and not get sick! I saw these Peanut Butter Krispy Bars on several food blogs and HAD to make them. 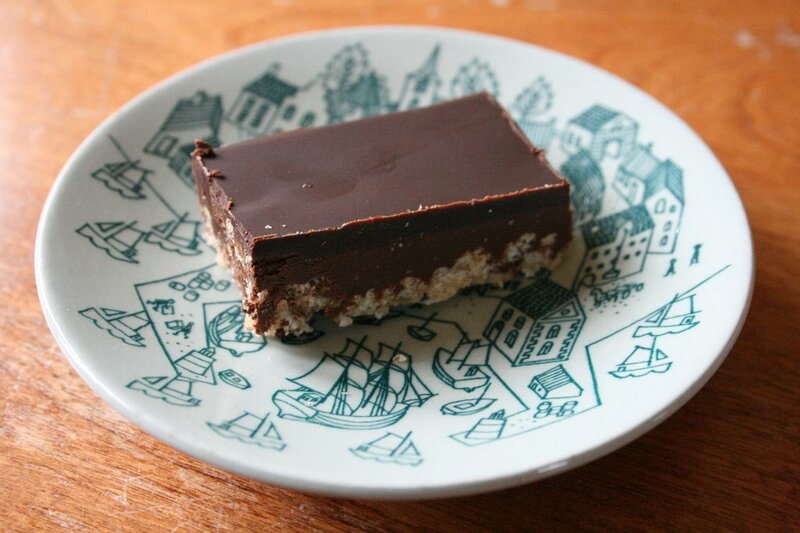 They are basically candied rice krispie treats with a layer of peanut buttery goodness and a chocolate topping. Yum, right? They are very, very rich, but I think I would make a few adjustments next time. I actually am a big fan of rice krispie treats, and I think these would benefit from having MORE of the rice krispie treat. With the current recipe, the rice krispie layer is very thin. I think it’s overpowered by the peanut butter layer. Also, I believe the original recipe calls for milk chocolate. I used bittersweet instead, because I thought the milk chocolate and peanut butter combination would be too sweet. I think this was a good call. All that said, Peter, who is NOT as big a fan of rice krispie treats as I am, thinks the bars were fine as is and would not increase the rice krispie treat to peanut butter and chocolate ratio. So, do what you must. I am too lazy to type out the recipe, so please go to Smitten Kitchen’s post about it, which is here. Her photos and everything are way better than mine, anyway! can we please make something delicious when i come up? Not bad taste at all. Now, if the recipe called for peanut butter crackers, that would be bad! PB and chocolate is my all-time favorite combo, thank you for sharing this! I make mine pretty much like this recipe http://www.cooks.com/rec/view/0,1947,148168-247200,00.html. Then I just melt the chocolate (bittersweet) and spread it on top. More rice krispies and a lot less dishes and time. Yum, that looks soooo good. The pb thing is news to me. Hopefully it didn’t make it to Japan because I just polished off my morning peanut butter pita bread (pbpb) toast while reading! I’ll admit that I’m not a big fan of rice krispy treats, but I’m willing to chance it because I really like chocolate and peanut butter together. Of course, the house is full of desserts right now (pear sorbet, rice pudding, bread pudding and cookies), because it is my favorite type of thing to cook! I’m not looking. I couldn’t make these – I used to make them as a teenager/young adult and the whole pan would disappear in a nano-second. I’m definitely got going to even look. Nope. Drat. I looked. Yuuuummmmmm. i can’t believe you use skippy. JIF ALL THE WAY! Yum! There is not combination I like better than peanut butter, chocoloate, and something crispy/crunchy. And cute plate, too. ooh, that looks yummy! cute plate, too.